Originally developed for the military, the OPS Muzzle Brake is the result of extensive research into muzzle gases and the effects of redirecting them for recoil reduction and accuracy enhancement. Excellent for big game as well as varmint cartridges ( The military uses it on 30 cal and 223). 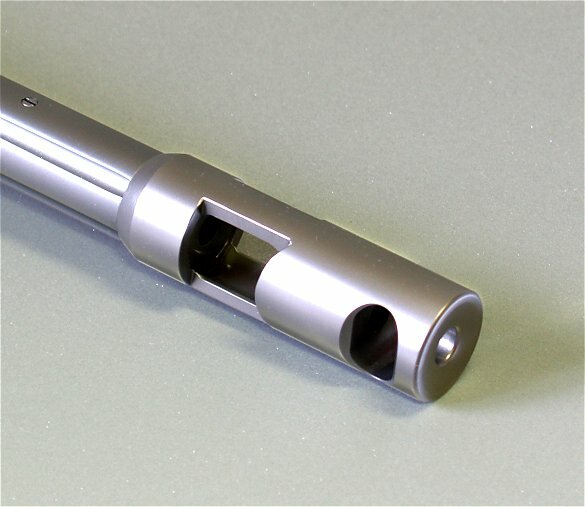 Recoil Reduction - The OPS Brake has a unique asymmetrical cupped primary baffle followed by a lateral secondary baffle. Recoil reduction of up to 70+% with virtually no “puff” back at the shooter… Varmint Hunters: No Dust Blow Ups! Accuracy Enhancement - The speed of sound changes with temperature so that within the OPS Brake, your bullet travels through an envelope of subsonic gas that enhances stability... Yes, that's pretty deep science. Rifles equipped with a preoperly installed OPS Muzzle Brake are extremely accurate and easy to shoot. The OPS Muzzle Brake comes in stainless finish only. It fits muzzle diameters from .530-.950 inch. Adds approx. 2”. 17-44 Caliber. Remember, this price includes our Precision Installation Process. See all of our muzzle brakes plus an explanation of our installation on our Muzzle Brake Home Page. Allow approx. 6-8 weeks for installation. I have had this muzzle brake on my Encore 7mm magnum barrel for some time now. The recoil reduction is absolutely amazing. I have a 243 full bull barrel I use for varmints, and I have more recoil from the 243 barrel than the 7mm magnum barrel. 62 grain 243 bullets as opposed to 150 grain 7mm bullets. You should expect the increase in the noise level with the muzzle brake, but small price to pay for recoil and accuracy. I also have a JP howitzer brake on a 45-70 single shot.